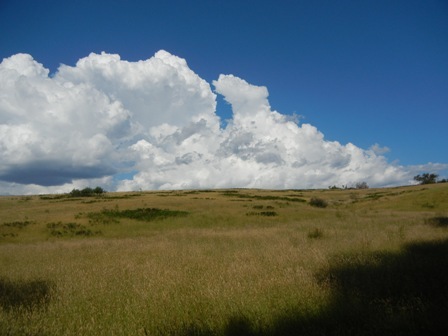 The last day of 2011 was rather hot (32 Celsius). The best place to be during hot weather is our dam. So we prepared some food and drink for a pick nick at Brownies Landing, that is how we called our jetty from which we jump into the water. 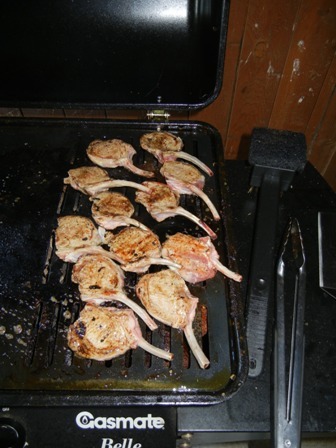 I threw a few lamb chops on to my barbecue, the girls prepared some dips, salads, cheese and other stuff and we were set for an afternoon at our dam. The water was cold and refreshing, and we stayed until sunset. I had picked up a few bottles of bubbly for New Years evening. 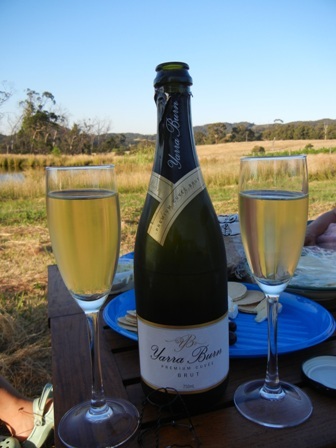 The dry sparkling of Yarra Burns is a fine bubbled wine made from Pinot Noir and Chardonnay which was very lovely. Bring on 2012. We are ready for it. 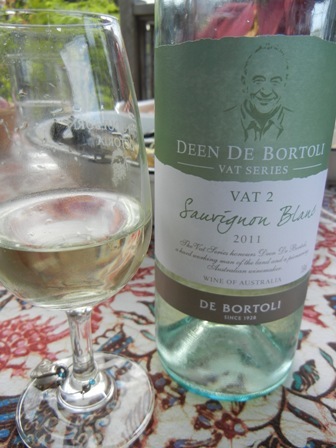 One of the nicest Sauvignon Blanc blends I had so far this summer is the ‘2011 Deen de Bortoli VAT 2 Sauvignon Blanc’ by de Bortoli Wines. This is a fresh and clean wine with strong herbal and tropical fruit flavours. The wine is medium bodied and low in alcohol (12%). About 50 % of the grapes for this brand come from old vineyards in the Riverina region in South Eastern Australia; the other half comes from the cool climate King Valley in Victoria. As you probably know, 2011 was a difficult year for wine makers all over Australia. First, there was so much rain, second there was so much pressure from fungal diseases and third not all grapes would ripen perfectly. 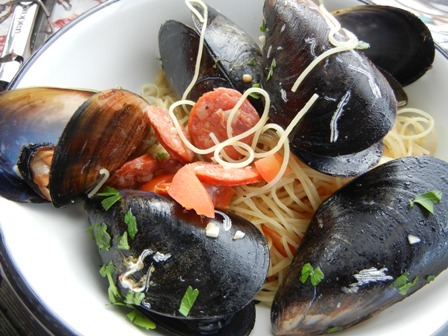 We enjoyed the wine with a pasta with mussels and chorizo. The perfect choice. After a very enjoyable trip to Port Melbourne where we visited our friends Phillip and Julia who live in a former church (a very interesting dwelling), we returned to the farm and spend a quiet evening at home overlooking the vineyard and the paddocks. Since we were spoiled with good food the whole day, we decided on a simple “German dinner” meaning cold dishes only. 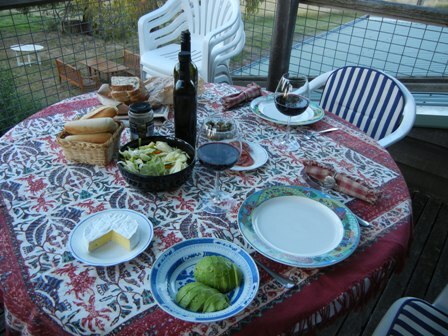 Some Australian cheese, cold cuts, olives, a salad and an avocado together with a German bread would do for the two of us. From under the sink, my secret stash of fine wines, I produced a bottle of ‘2008 Inigo Shiraz’ by Sevenhill Cellars in the Clare Valley in South Australia. The bottle was left from last years special order which we got through our friend Neville Rowe, who used to work there as marketing manager. 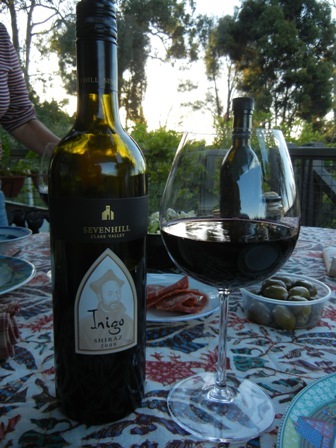 The ‘2008 Inigo Shiraz’ is an old fashioned red, beautifully round and full of flavours, with a lot of alcohol, in short an “umpf” wine, a wine with character. The grapes come from old vines (very old ones) and display black cherries and other dark fruit aromas. The tannins are smooth and has the spicy character we so much love in Shiraz. The finish is long and memorable. Well, when I work in the vineyard, I inevitably think of the Bible and the many stories about vineyards in the biblical age. In fact many vineyards and wineries in my home town Trier and along the Mosel valley would not exist without “clerical” support. The Jesuits of Sevenhill Cellars in the Clare Valley know how to make wonderful wines. My tip: try some wines from Sevenhill Cellars. You won’t regret it. Apart from Riesling, I also love Sauvignon Blanc wines. Summer is the ideal seasons to savour them. We had bought a couple of bottles from various origins from our local grocery shop. Two of these wines I want to introduce to you today. The two could not be more different. 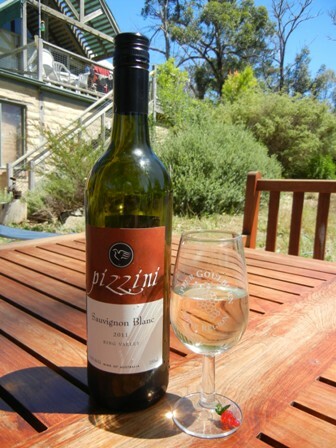 The first is a ‘2011 Sauvignon Blanc’ by Pizzini in the King Valley, a cool climate wine region in Northeastern Victoria. These days low alcohol wines are very much en vogues, especially white wines. The Pizzini SB is one of them (11% alcohol). 2011 was a difficult vintage in Victoria. That somehow also shows in this wine. It is a bit “muted” in my view, but still enjoyable. I love the apple aromas and the well balanced acidity. The second wine could not be more different from the first. 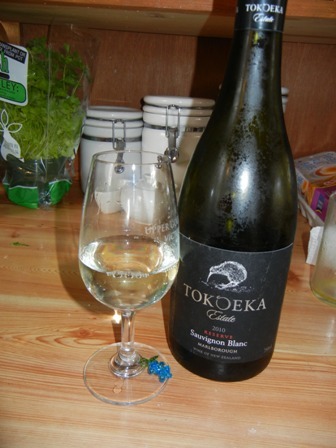 The ‘2010 Sauvignon Blanc Reserve’ from Tokoeka Estate in Marlborough, New Zealand has 13.5% vol. alcohol. It displays the full herbaceous character of the Sauvignon Blanc grapes. It is round and complex and has a long finish. The wine is clean, crisp and the acids are elegantly balanced. Amazing what one can do with SB grapes. 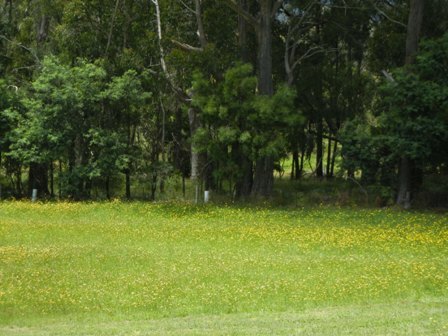 It was a glorious day on the farm in Glenburn. Just the right day for a first pick-nick near our second dam (the one we use to irrigate the vines). We had bought some inexpensive bubbly (below 7 A$), a ‘Sacred Hill Sparkling Brut’ (non vintage) by De Bortoli, from the Riverina in New South Wales. 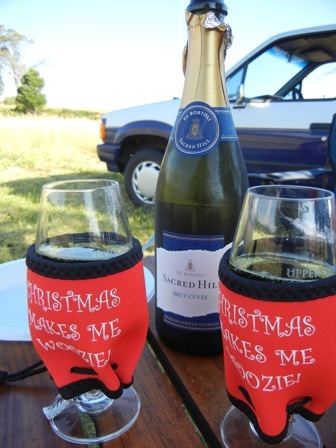 It was the perfect drink for a hot summers pick-nick, just days before Christmas. I liked the crisp acidity and the strawberry nose. We thought that a bottle of ‘Sacred Hill’ would just be the right stuff to be drunk at Two Hills Vineyard. Another day in paradise came to a marvelous end. We are back on the farm for our Christmas vacation. Yesterday was my first full day. After a long flight from Ulaan Baatar, Mongolia via Beijing, China and Bangkok, Thailand, I had finally gotten to Melbourne. My family picked me up and off we went to Glenburn which we reach at about midnight. I had traveled a fair bit to get back to Australia, not only distance wise. But Mongolia had minus 37 Celsius (Beijing minus eight) and it went to about 26 plus in Bangkok. The Melbourne night was cool and I slept like a baby in our shed in the countryside about 2 hours north of the Victorian capital. It is so quiet out here. The night is very dark. We are out in the countryside and one does not see many people. I worked a bit around the house. After that we had our first family meal together. 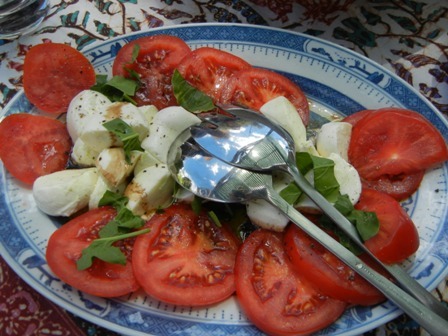 I tell you it was just sensational to have a zucchini paste and an insalata caprese. Look at the two pictures below, doesn’t the food look delicious? What about the wine, you might ask? No, we did not have a Two Hills Merlot with the meal, but instead…. 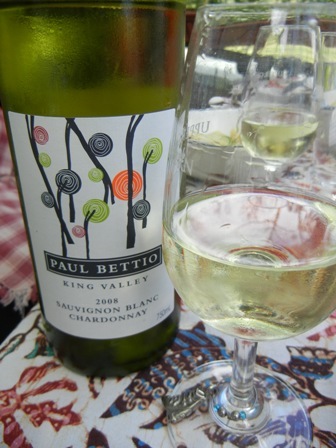 ….we had a ‘2008 Sauvignon Blanc Chardonnay’ blend by Paul Bettio from the King Valley. I am not a fan of a SB-Chardonnay blends in general. I prefer the two varieties as single grape wines. But this medium dry wine was just a great refreshing drink. 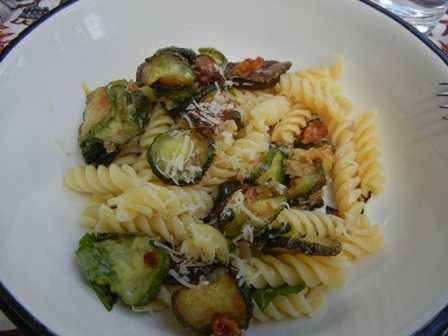 The tropical and citrus fruit flavours went very well with the light pasta and the salad. 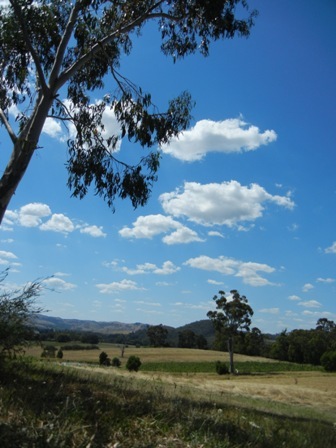 The King Valley is one of my favourite cool climate wine regions in Victoria. I will tell you more about its wines at a later stage. I am terribly frustrated right now. Sorry folks. After traveling in China where there is no access to my blogging site, wordpress.com, I have finally reached free Mongolia. I was looking forward to finalize and present a couple of stories to you which I carry with me since our holidays in Canada and wanted to share with you some notes on the excellent wines I brought back with me. However, the internet in the hotel is so slow that I can hardly up-date my beloved the Man from Mosel River blog. At least the photos cannot be uploaded and what’s the point without them? Alas, the other functions seem to work. So let me share some thoughts about the year which is soon coming to an end. 2011 was a very busy year for me. My job required more and more traveling, mostly in Asia. This brought me to interesting places. That was the good news. But it also left me less time on my hands for writing up my posts. In the past, I usually had some time for further research and consequently could beef up my little stories with some additional facts and figures. These times are over, it seems. My stories are becoming shorter and shorter. I try to make up for this by adding more pictures. But is this a solution? No. I noticed with surprise that I have almost completed my 5th year as a blogger. There were occasions when I wanted to call it a day and move on, do other things in my life. So far I have returned to my blog and tried my best to keep it up. Giving up is not an issue any more. I might have to change a few things. When I visit blogs and websites produced by the professional wine and food writers I feel utterly inadequate. Goodness me, how poor is my writing, how limited my knowledge? I should add fancy stuff, little video clips here and there. In fact I do have some, but just not the time to cut and edit them so that they become interesting. But I enjoy visiting blogs of other, non-professionals but enthusiastic wine bloggers. My own little vineyard in Australia, Two Hills Vineyard in Glenburn, was not successful from a commercial point of view. It has become a hobby, an expensive one, I freely admit. But we are hanging in there and hope that the mothballing can one day be lifted. Well, I was warned. You all know the joke, how to make a million dollars in the wine industry: invest ten million. Well, we sold out our 2004 vintage of Merlot, the best one we ever made. The 2006 vintage is doomed, it seems. We might “resurrect” the 2008 Merlot; finally label the bottles and bring some on their way to Germany. My feelings of the running hamster in the wheel were mitigated by the moments of glory, the moments when I sat and enjoyed good food and fine wine, among friends and family mostly or at times in a far away place all by myself. I just love to eat and drink fine stuff. The comments I receive are of course also encouraging. It seems that some people are reading my stuff. Some of them like what I write and let me know about this. My stats are not bad in my view. I have moved up all the time over the last five years. So what was my highlight of 2011? Let me select three issues. I had the opportunity to taste more fine Riesling wines from the Mosel, the Saar and the Ruwer, and actually I cannot get enough of them. They are the best for me, no doubt. The quality of these wines has gone up over the last years. The producers experienced one excellent vintage after the other. It is such a pleasure to indulge in these wines. Unfortunately, these wines are difficult to get where I live. Since wine is heavy I carry these Rieslings bottle by bottle when returning from trips to Germany. The family vacation to Canada in July this year gave me the opportunity to explore some of the wine regions there, particularly Prince Edward County. I was very surprised by the high quality of these wines, especially the Chardonnays and the Pinot Noirs. The islands is very picturesque, the hospitality of its people is great, there is good food and excellent wines. the number of wineries is sizable but many of them are family businesses and not agro-industrial complexes of huge size. But Canadian wines you cannot get hold of overseas, except maybe for the sweet desert wines on offer in some airport duty free shops. Thailand is more famous for its beaches, its cuisine and its nightlife than its fine wines. But let me tell you that the quality of its wines in general is very good and that many wines are just excellent. There are fewer than 10 wineries in the country, and not all of them have a resident wine-maker. But the people behind the wines, the vintners, winery owners, vineyard managers and oenologist, are passionately loving their soils and grapes and produce wines of international standards. The number of international awards won by Thai wines has multiplied in 2011. The good news is, that these wines are available in Bangkok where I live. Next Monday morning I will be on my flight to Melbourne for a three week Christmas vacation. I already know that instead of blogging I will spend most of my time on the farm, in the vineyard, planting trees (one of my passions) and enjoy the tranquility of the Victorian countryside. I will take long walks, and spend hours among family and friends. I will just be there and relax. I will not think too much of the future of my little vineyard neither of my professional future. I would like to thank all my readers and the casual visitors for coming by and having a look. I hope you come again. Let me know if you like or dislike something and share with me your own experiences and stories. A good story is always worth to be shared. Cheers folks, happiness, good health and long life also in 2012. You are currently browsing the The Man from Mosel River blog archives for December, 2011.